"Lost Amusement Parks of the North Jersey Shore" June 2017 Book Giveaway ~ The History Girl! 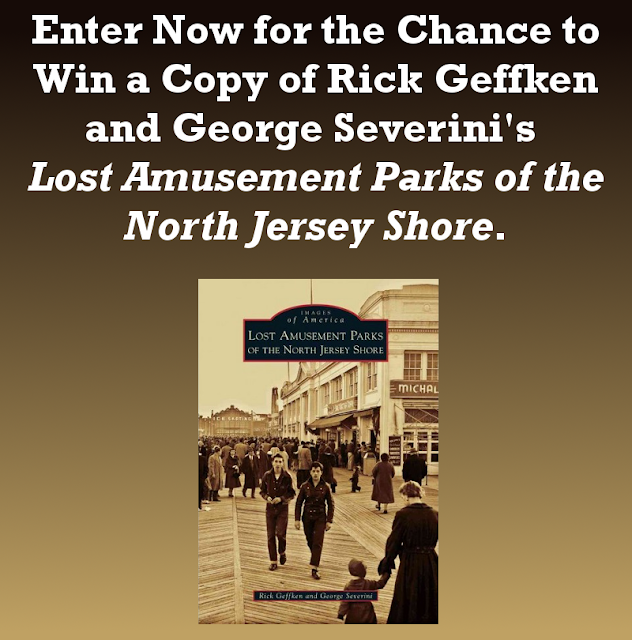 Thanks to authors Rick Geffken and George Severini and Acadia Publishing, The History Girl is offering one copy of their book Lost Amusement Parks of the North Jersey Shore (Images of America). In order to be in the running, submit your name and e-mail address below! The Jersey Shore has always attracted people seeking relief from summer heat and humidity. Long before Europeans came here, the native Lenape clammed, fished, and played games on the beach and in the surf. These original people could scarcely have imagined that, by the end of the 19th century, the 120-mile-long coastline of New Jersey would be dotted with amusement parks featuring gentle kiddie car rides, terrifying roller coasters, merry-go-rounds, and fast-food emporiums. James Bradley in Asbury Park and William Sandlass Jr. in Highland Beach created mass entertainment for hundreds of thousands of people. Their seaside recreation centers, along with those in Long Branch, Bradley Beach, Pleasure Bay, and others, endured for years but are just fond and fading memories today. *One entry per person. *Valid for all residents of the 50 United States of America, 13 years of age or older. *Entries without a valid e-mail address are not eligible. *Contest begins June 11, 2017 at 6:00 pm EST and ends June 17, 2017 at 8:00 pm EST. *The winner will be chosen at random. *The winner will be notified via e-mail on June 17, 2017 after 8:00 pm. The winner must respond with a mailing address within thirty-six (36) hours or another winner will be chosen.